Designate #35 Cooper Square a NYC Landmark! Preservationists want the city to reconsider landmarking the nearly 200-year-old building at 35 Cooper Sq. EAST VILLAGE — Advocates gathered Friday to push the city to preserve a nearly two-century-old property on Cooper Square that they fear will be lost without landmark protection. 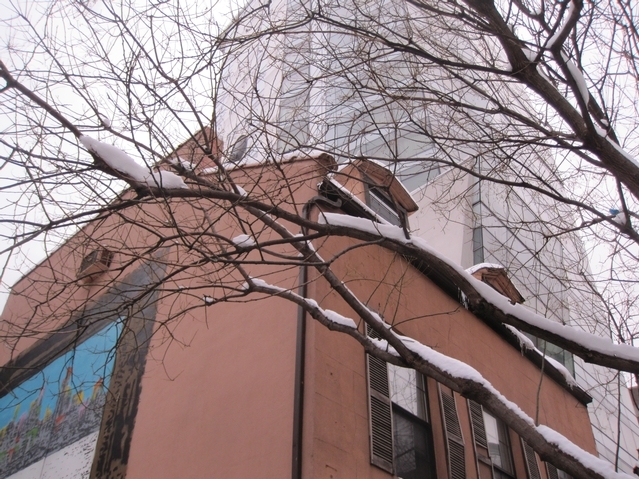 The Federal-style rowhouse at 35 Cooper Square — sandwiched between the gleaming new Cooper Union academic building and the towering Cooper Square Hotel — was once owned by a descendant of Peter Stuyvesant before housing such luminaries as Liza Minelli and Beat Generation poet Diane DiPrima, historians noted. The property, at the corner of East 6th Street, sold to a developer for $8.5 million late last year before rumors began swirling that the new owner planned to demolish the 1825 building, which houses a restaurant on the ground floor. In response, advocacy groups, historians, elected officials and area stakeholders urged the city's Landmarks Preservation Commission to designate the property a historic landmark. However, the LPC has so far declined to act on the proposal, citing the addition of stucco over the building's original brickwork as the reason for not considering the address for landmarking, a commission spokeswoman said. "This is very frightening and very disappointing to us, because that building is the oldest building on that part of the Bowery," said David Mulkins, co-founder of the Bowery Alliance of Neighbors, which has also proposed height limits on the Bowery's eastern edge. "We've lost so much of the historic resources in this area. There's such a staggering amount of historical and cultural significance on the Bowery." At the rally on Friday, dozens gathered to defend the building's importance and urge the city to intervene before it's too late. "We are at a critical point," said Assemblywoman Deborah Glick, who wrote to LPC chairman Robert Tierney this week asking that the building be landmarked. "There is a tipping point at which this area will no longer have a connection to the past." Simeon Bankoff, executive director of the Historic Districts Council — which recently named the Bowery one of the city's six most endangered areas — said that without more landmarking protections, the city risks wiping away the character that draws people to the area in the first place. "Part of why people come here is the historic buildings," he explained. "We only ask that the city do its job." The effort dovetails with attempts by the Bowery Alliance of Neighbors to add height limits to the Bowery's eastern side, where no such restrictions currently exist. High-profile Bowery business owners like restaurateurs Keith McNally and Daniel Boulud, as well as fashion designer John Varvatos, previously pledged to support the proposal. On Friday, preservationists sought to start with the building at 35 Cooper Square and then work their way southward down the Bowery. "This is not Abu Dhabi!" said writer/poet Hettie Jones. 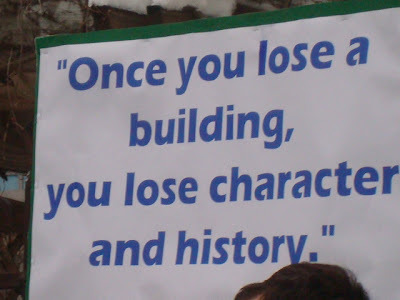 "We must not allow those who venerate bigger and taller to dishonor our city's past." Well, the pubs gone, let's hope for better news on the building. The following photo is a harbinger of bad news. Two days after the rally at its doorstep, Cooper 35 Asian Pub went belly up and is currently clearing house. Not looking good for fans of 35 Cooper square. We also noticed people dismantling the planters on the patio to salvage the plants apparently. And as our tipster noted, there were a few people in the garden salvaging some greenery. 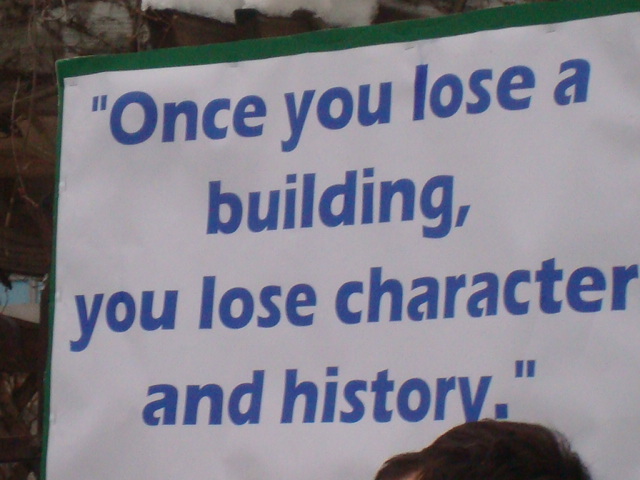 You can head over here to sign a petition to save the building itself from demolition. At 185-years-old, the Federal-style house is the last of its kind in Cooper Square and deserves a landmark. Kadahar-on-Hudson! How can this not be protected? On Friday, Jan. 29, a crowd of Greenwich Village residents, elected officials and New York University students assembled outside 35 Cooper Square, waving signs amidst the fresh snow. The rumor of demolition loomed over the 186-year-old-building, which was sold last October for $8.5 million, and the unlikely alliance was pushing for 35 Cooper to be landmarked. But by the end of the week, Bowery Boogie reported that the ground-floor bar and restaurant, Asian Pub, had closed, and workers cleared out the building’s innards, while others salvaged what vegetation could be found outside. Asian Pub’s lease had come to an end, and the building’s future was looking more and more uncertain. As a last ditch effort, preservationists began circulating a petition and exhorting their neighbors to write to the Landmarks Preservation Commission (LPC), the city agency responsible for historic preservation, to landmark the building. Such a designation does not necessarily prevent demolition, but owners must obtain a “certificate of appropriateness” for any alterations to a the exterior of a landmarked building. An owner can also apply for alterations by citing an economic hardship, although such requests are rarely approved. The LPC has thus far declined to hold a public hearing on 35 Cooper, the first step in landmarking, because stucco covers its original brick façade, according to LPC spokeswoman Elisabeth de Bourbon. And while preservationists and local officials have created a groundswell of support for 35 Cooper, some citing its age, others its cultural heritage — tenants have included the great-grandson of Peter Stuyvesant and beat poet Diane DiPrima — the LPC has remained resistant, focusing on the current structure, rather than its history. In fact, the current owners of 35 Cooper Square have not yet decided whether to demolish the existing structure. City records trace the ownership to the Arun Bhatia Development Organization, which has built dorms for the New School and seven condo towers, most recently 137 Wooster Street. Massey Knakal’s Special Asset Strategy Group brokered the sale of the building and two parcels to the north last October, fetching around $293 for each of the entire lot’s 28,998 buildable s/f. 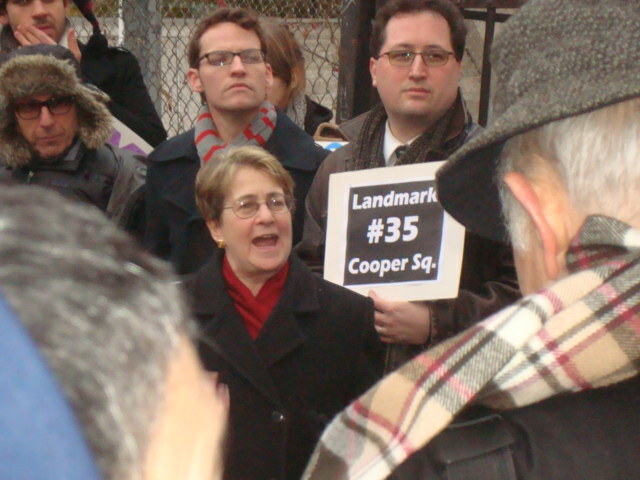 Indeed, 35 Cooper and its adjacent lots represent a rare opportunity for developers. Despite being surrounded by the large Greenwich Village historic district to the west and height limitations along Third Avenue to the north, the swathe of land along Cooper Square has no historic or zoning regulations, allowing developers to build up to a zoning that allows for commercial uses such as hotels and offices, as well as residential. Recent nearby projects have included the Cooper Union’s immense academic building and the glassy Cooper Square Hotel. 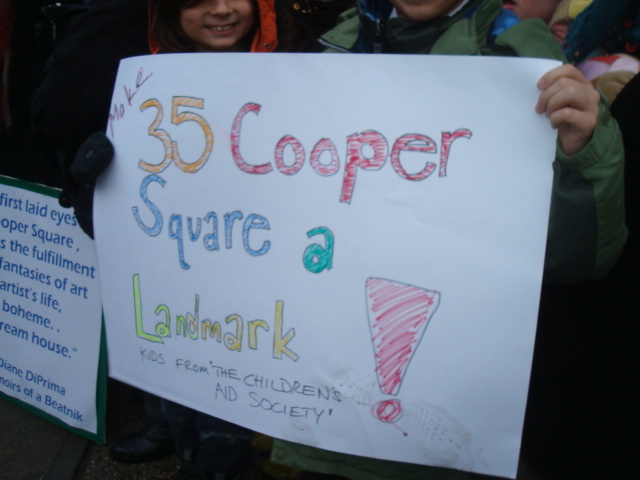 Preservationists continue to fight for 35 Cooper, but their options are limited. “I think the one hope that we have is that the commission will change its mind,” said Andrew Berman, executive director of the Greenwich Village Society for Historic Preservation, who described LPC‘s standards as “frustratingly inconsistent.” He cited 511-513 Grand Street as examples of federal-style buildings that were more heavily altered than 35 Cooper Square, but ones that were nonetheless landmarked in 2007. On the other hand, Berman said, Arun Bhatia Development could potentially leave 35 Cooper intact and build only on the two northern lots, although such an effort could require more “outside the box thinking.” Still, he remains hopeful that a compromise can be reached. 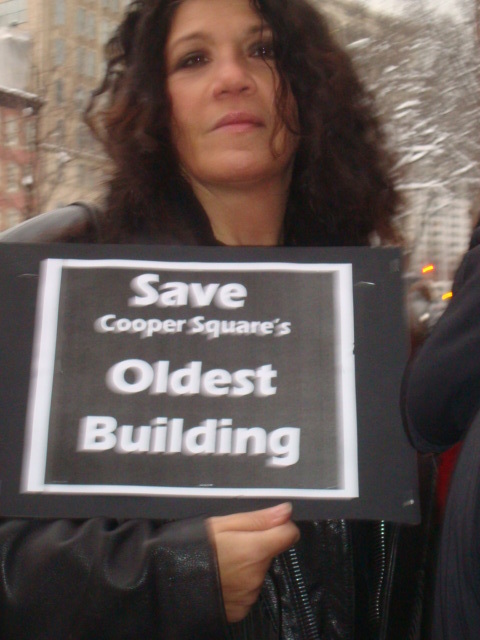 “Most people agree that it would be better to save 35 Cooper Square,” said Berman. Preservation advocates gathered in front of 35 Cooper Square on Friday afternoon demanding that the Landmarks Preservation Commission protect the early-19th-century, Federal-style building by giving it landmark designation. L.P.C., however, has said the building has been too altered by the addition of a brownstone coating to its facade to qualify as architecturally eligible for historic designation. For the past decade, the building was the location of Cooper 35 Asian Pub — a bar popular with New York University and Cooper Union students. Last November, 35 Cooper Square and its adjoining space at the corner of E. Sixth St. were purchased for $8.5 million by Bhatia Development, an organization that intends to demolish the building. Indeed, the Asian Pub served its last drink on Saturday night Jan. 22 and closed for good. Last Friday’s rally, led by David Mulkins, chairperson of the Bowery Alliance of Neighbors, or BAN, included Assemblymember Deborah Glick and state Senator Tom Duane, as well as preservation leaders Simeon Bankoff, executive director of the Historic Districts Council, and Andrew Berman, executive director of the Greenwich Village Society for Historic Preservation. “This is one of the most significant buildings on this street,” said Mulkins. “If we lose this building, Cooper Square loses a much earlier sense of its history,” he added. Mulkins referred to the recently built 20-story Cooper Square Hotel across E. Sixth St. from the site, saying, “If we have this kind of out-of-scale, out-of-context development, we will destroy the sense of place that we get in these historic neighborhoods.” He noted that the Bowery was one of the world’s most renowned neighborhoods. 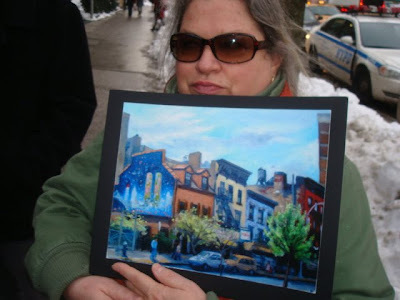 “The Bowery that has been known over the centuries is vanishing before our eyes,” Bankoff said. “At this point we have to say, Stop. 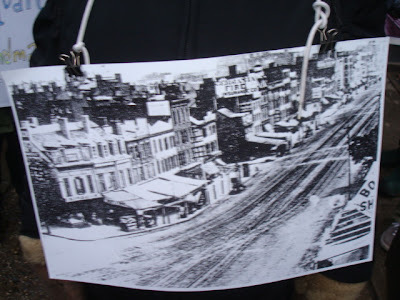 Demonstrators waved signs saying, “Build Memories, Not Luxury Hotels,” and displayed photos showing the neighborhood as it was at the turn of the last century. Carolyn Ratcliffe, an East Village preservationist, carried a poster reminding passersby that the poet Diane diPrima and the singer Liza Minnelli once lived in the building. Jim Power, 62, “The Mosaic Man,” who transformed lampposts all over the neighborhood with tile mosaics, urged demonstrators to employ direct action to preserve the area. Power was also incensed about the city’s proposed alterations that would close Astor Place between Lafayette St. and Fourth Ave., which he fears would eliminate lampposts with his mosaics. Glick, who sent a letter to L.P.C. Chairperson Robert Tierney urging him to reconsider his finding that the building does not qualify for landmark protection, told the Friday crowd that, “We are at a critical point. There is a tipping point at which this area will no longer have a connection to the past.” Glick pledged not to give up her efforts to save the building, which dates back to 1825. Last fall, City Councilmember Rosie Mendez also sent a letter to Tierney urging landmark protection for the building, located on a site once owned by a member of the Stuyvesant family. The original address of 35 Cooper Square was 391 Bowery, according to a research paper that Sally Young, a BAN member, sent to L.P.C. The original two-and-a-half-story building, with a gambrel roof, twin dormers and large end chimneys, had a ground-floor storefront with a brick arch and decorative cast-iron pilasters added around 1876. The crushed-brownstone stucco covering the Flemish-bond brick facade was likely added around the same time. Owned by the Stuyvesant family, it was first occupied by a John Snider. By 1867, Herbert Marshall sold liquor out of the ground floor, continuing until 1876. In 1900 the building apparently operated as a hotel. In the second half of the 20th century, a painter, J. Forrest Vey, whose works are in the Whitney Museum of American Art, lived in the building. In the 1960’s, tenants like diPrima and Minnelli began renting upstairs rooms in the building. Poet diPrima and her then husband, Alan Marlowe, ran a few seasons of the New York Poets Theatre from 35 Cooper Square. Claude Brown, author of “Manchild in the Promised Land,” also lived there. 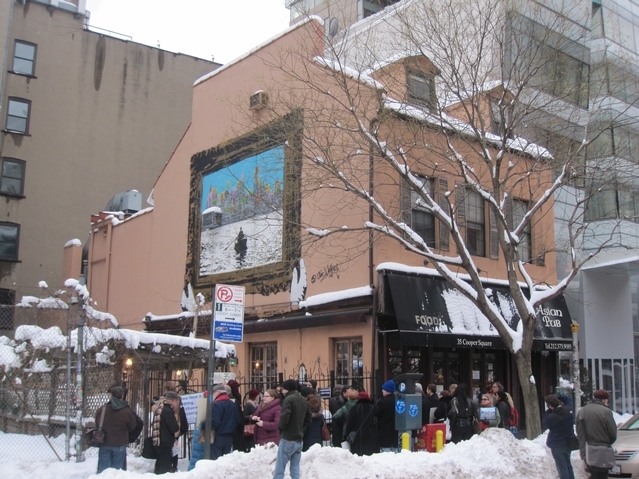 In 1970, Stanley Sobossek, a painter, ran a bar on the ground floor. In 1976, a woman named Hesae owned a restaurant known by that name at 35 Cooper Square until 1990. She returned around 2000 and ran Cooper 35 Asian Pub until last Saturday. methinks that strip has already tipped. 35 Cooper Square might be razed quicker than previously thought. Precisely one week after the rally and subsequent closure of Cooper 35 Asian Pub, activist Sally Young informed Vanishing NY that scaffolding just arrived on scene. Don’t know what this means, but scaffolding is going up in front of #35. The permit they applied for is an Alteration 3, which is supposed to be minor (facade work). It is also apparently a round-a-bout way to get a demolition permit more easily. INSTALLATION OF 80 LINEAR FEET OF HEAVY DUTY SIDEWALK SHED FOR BUILDING ALTERATION, FILED SEPARATELY. LIVE LOAD 300 PSF. SIDEWALK SHED SHALL COMPLY WITH CHAPTER #33 OF THE 2008 CODE. NO CHANGE IN USE, OCCUPANCY OR EGRESS UNDER THIS APPLICATION. Guess we won’t need to wait “three or four weeks” to hear from developer Arun Bhatia. Why bother with scaffolding? Let's stop pretending that we're in a civilized place. These guys are appropriate for this job. I doubt the neighbors would agree. I am utterly floored that this building is not protected. As of yesterday it seems they'd stripped off most of the top surface of roofing material (likely to contain asbestos). APPLICATION FILED FOR FULL DEMOLITION OF 3 STORY BUILDING. The scope of work does not require related asbestos abatement as defined in the regulations of the NYC DEP. Since starting his career as a residential real estate developer in 1977 with $10,000 to his name, Arun Bhatia, an immigrant from Bombay, has developed over 20 projects with 2,000 plus homes, for a value in excess of $600 million. Now, after almost thirty years in the New York City residential market, Bhatia, founder and CEO of Arun Bhatia Development Organization, is unveiling two new residential condominium buildings in Manhattan. One is The Capri Tower Residences, at 235 East 55th Street; the other is a new luxury condominium development at 139 Wooster Street in SoHo's Cast Iron historic district. • More details will be provided in "three or four weeks"